The heart of Copenhagen is surprisingly compact. In fact, it’s one of the easiest capitals to navigate that we’ve ever been to. 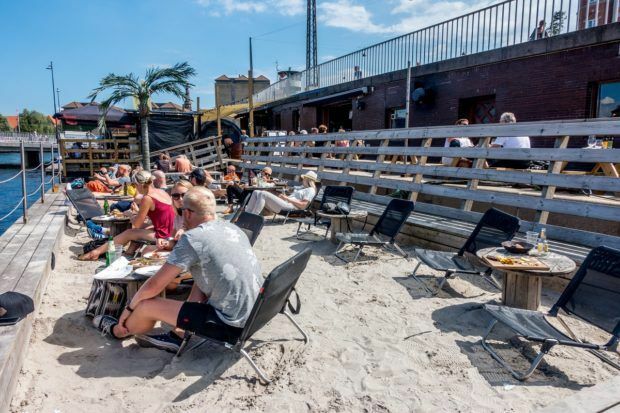 You can visit the shops and market of the Meatpacking District, take a spin through animated Tivoli Gardens and even visit the beach on your way to the city’s picturesque old harbor, all in a walk that barely breaks two miles. 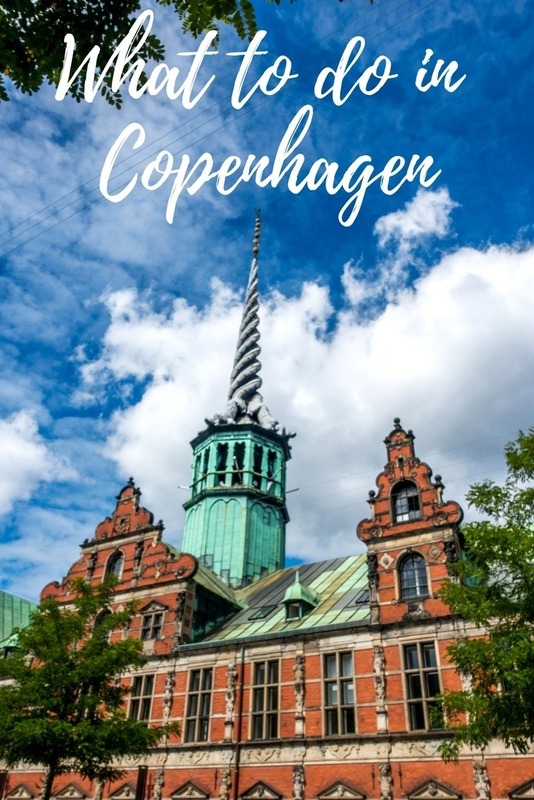 But that’s just a fraction of the things to do in Copenhagen. This colorful old city is full of hip and history at the same time and yet has a relaxed vibe that makes you want to linger in every spot. Here are some of our favorite things we discovered in 3 days in Copenhagen. Its vibrant colors, beautiful ships, and lively atmosphere make Nyhavn one of the top places to see in Copenhagen, so it was high on our list of destinations. Originally a busy port 400 years ago, Nyhavn is one of the most recognizable parts of city. Nyhavn has a lot of great cafes and lovely canal houses to see from the 17th century, including house number 20 where author Hans Christian Andersen lived when he published his first volume of fairy tales in 1835. You can spring for the pricey restaurants (the view costs a premium) or pick up a snack and some drinks to enjoy right by the water. Either way, it’s a great place to linger. Once we had our fill of the fun of Nyhavn, it was time to see Copenhagen in a different way—from the water. Getting a different perspective on the city in an hour-long cruise is one of the most fun things to do in Copenhagen. During the tour that leaves from Nyhavn, you’ll see the pretty harbors and canals of the city along with a lot of the major sites. We cruised by the Opera House, Amalienborg and Christiansborg Palaces, and the Little Mermaid. A canal cruise is a perfect way to see the city and save your feet at the same time! 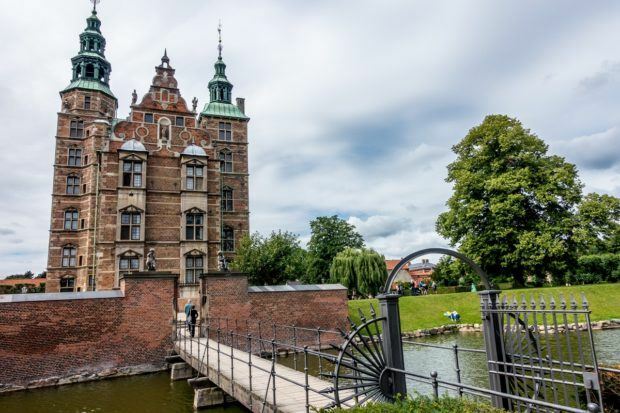 Rosenborg Castle (aka Rosenborg Slot) was once the summer home of King Christian IV but now stands in the middle of the city, making it one of the most opulent places to visit in Copenhagen. 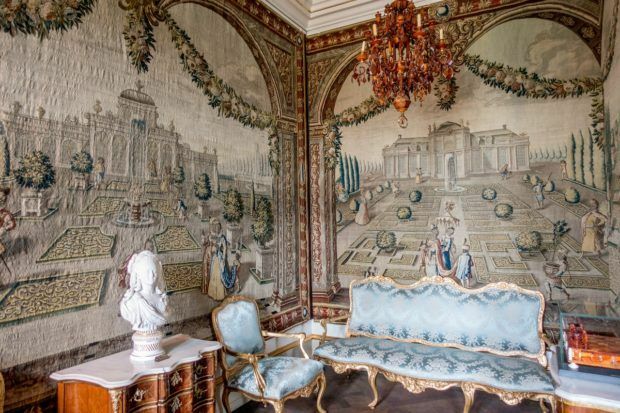 Surrounded by gorgeous gardens, the 400-year-old castle is a surprisingly-manageable 24 rooms decorated in marble, gold, silver, and brocade fabrics. Cherubs dance across the ceilings and forest scenes decorate the walls while giant silver lions guard the ancient thrones. Downstairs, the Crown Jewels are really the star of the show. Dating from the king’s coronation in 1596, the crown made of seven pounds of solid gold and precious stones is really a sight to behold. The Rosenborg Castle Gardens–also known as the King’s Gardens–is one of the prettiest places to see when you visit Copenhagen. The 12-hectare park was established in the early 1600s as a place for the royals to relax and for the staff to grow food and ornamental flowers. Now, 2.5 million people enjoy strolling through each year. 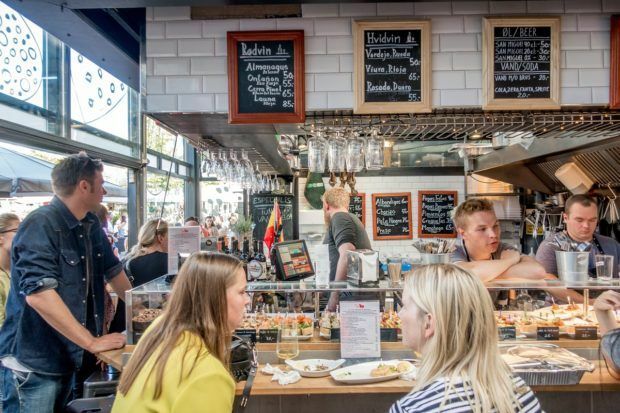 Food markets are always at the top of our list, and Copenhagen has several that are full of spirit and great food. At Torvehallerne, the city’s amazing food hall, visitors can pick up treats for home cooking or for souvenirs. But one of the best ways to enjoy the offerings and ambiance here is to relax at one of the many cafes preparing fresh dishes right in front of you. Torvehallerne is a great place for browsing or a meal even if you just have one day in Copenhagen. 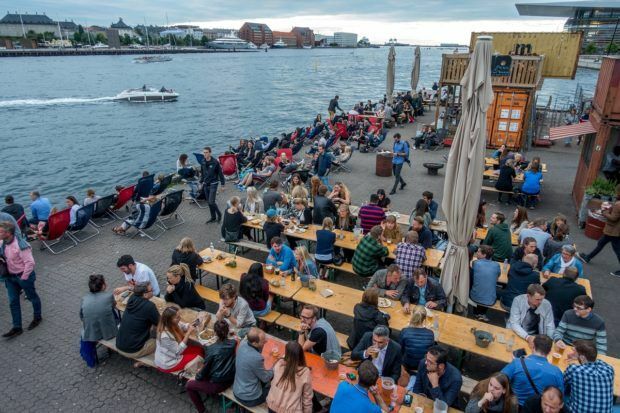 Copenhagen Street Food focuses on prepared food from all over the world. Its 40+ food stalls offer everything from tacos to Indian specialties, and each one is required to have at least one dish for DKK 50-75 (USD $7-11), which is a true bargain in pricey Copenhagen. 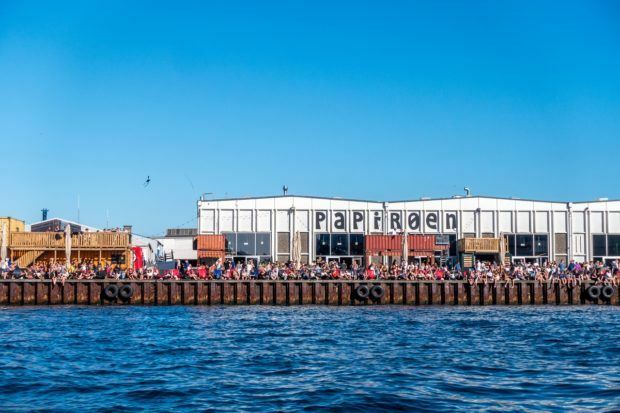 Copenhagen Street Food, which was well-known in its location on Papiroen/Paper Island moved to Reffen in May 2018. With a very different vibe, the Kodbyens Mad & Marked sets up every weekend in the summer in Copenhagen’s Meatpacking District. It hosts a wide variety of stalls with diverse offerings and moderate prices. Some weekends have special themes like wine, beer, or foods from different countries, which means you’ll find something new and different every time you visit. 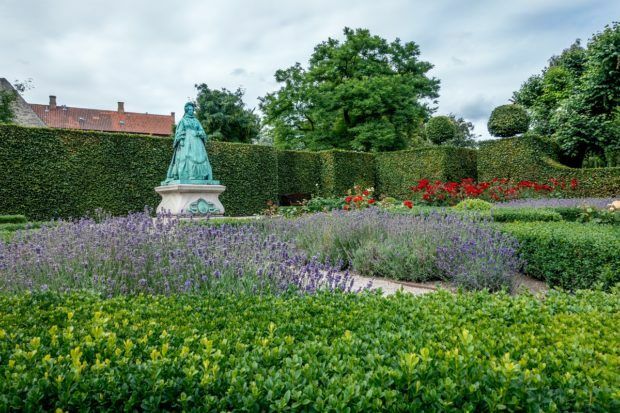 For nearly 150 years, the University of Copenhagen Botanical Garden has offered over 10 hectares of green spaces and gardens in the heart of Copenhagen. With over 13,000 plants, from all over the world, the garden is a perfect place to relax on a summer day and is a highlight of Copenhagen sightseeing. In the gardens, you can stroll by lilies, tulips, roses, and thousands of plants you’ve never heard of, including some from the Arctic. One of the garden’s most unique features is its 27 historical greenhouses that date back to 1874. 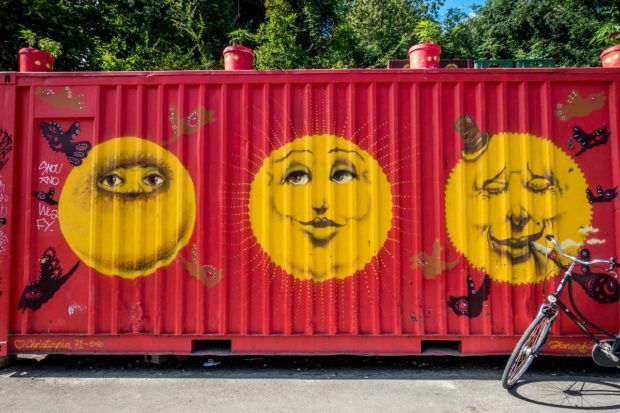 Visiting Freetown Christiania was an unusual experience but definitely one of my favorite things we did on our Copenhagen trip. Established in 1971, this self-proclaimed free state was formed when squatters took over an abandoned military base and formed an alternative society with its own system of government, flag, and currency. Today, 850 adults and children call Christiania home. They have built houses and turned old army warehouses into cafes, art galleries, and even a school. There is art and sculpture everywhere. Residents police themselves and even allow the infamous area called “Pusher Street” where marijuana dealers pedal their wares. 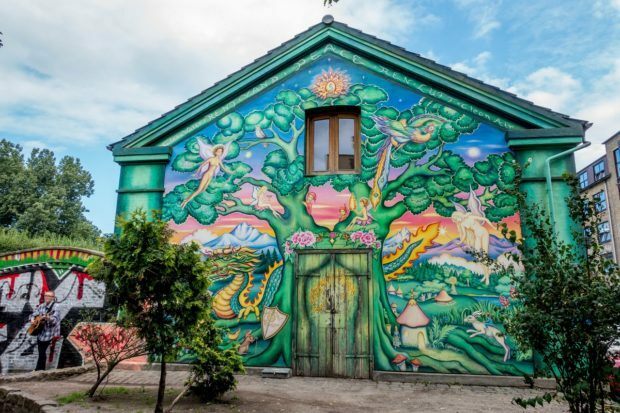 It’s possible to visit Christiania on your own, but we loved taking a resident-led tour. Hearing directly from someone who lives there gave us a better understanding of life in this unique enclave that is one of the top attractions in Copenhagen. 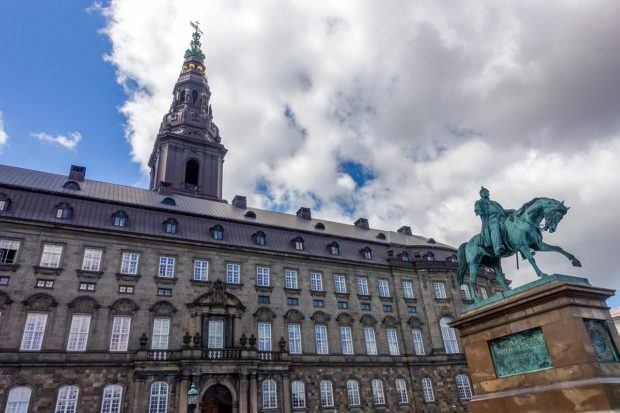 Though no longer the home of the Royal Family, Christiansborg Palace still occupies an important place in the history and present-day life of Copenhagen. It is the home of the Danish Parliament and the Supreme Court. Christiansborg is also used for important royal ceremonies and meetings. 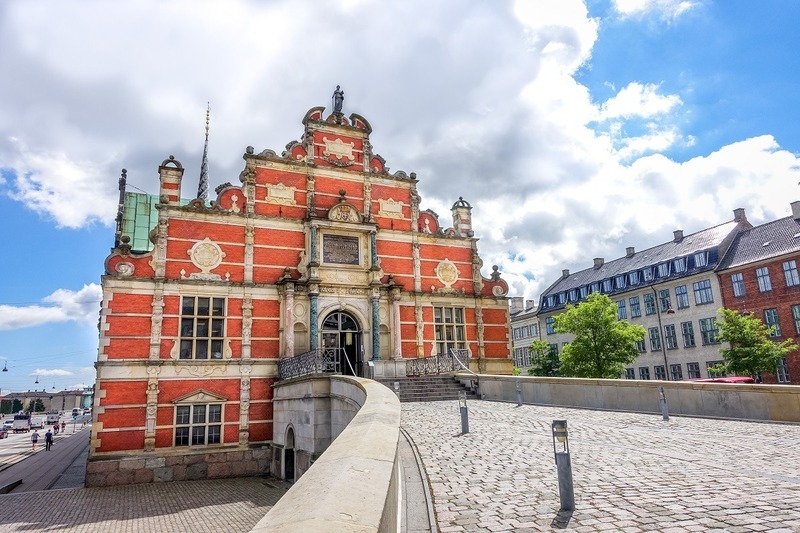 In many ways, it maintains the grandeur of a palace with features like the Throne Room and the Great Hall, which displays spectacular tapestries showing the 1000-year history of Denmark. 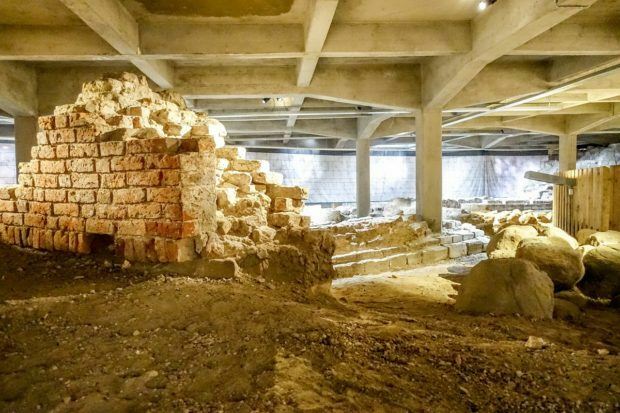 One of Christiansborg Palace’s most remarkable features lies below ground—the ruins of the palace. Rebuilt multiple times, the current Palace sits on the foundations of a building (Absalon’s Castle) that date from 1167, a small part of which can still be seen. There are also later ruins of towers and the palace that burned, which was completed in 1754. Amalienborg Palace has been the official residence of the Danish Royal Family since 1794 when Christiansborg Palace burned. Amalienborg is unique because it is actually made of four former mansions previously owned by nobility, which the royals took over following the fire. At the center of Amalienborg Palace–one of the most famous Copenhagen landmarks–is a courtyard which is occupied by a massive statue of King Frederik V on horseback. Time your visit around noon, if you can. That’s when the royal soldiers—in their midnight blue uniforms and bearskin helmets—perform the Changing of the Guard ritual. When the Queen is in residence, they are accompanied by a marching band. 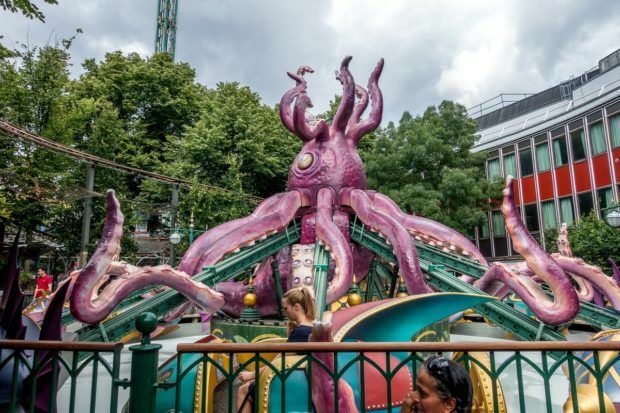 The second-oldest amusement park in the world, Tivoli is like nowhere we’d ever seen. For starters, it’s right in the heart of the city (luckily, only a 5-minute walk from our Airbnb). In many ways, Tivoli Gardens looks just like it did when it opened in 1843. It has a fanciful 19th-century feel with its beautiful gardens and fountains, merry-go-round and boat rides, and designs that feel straight out of Alice in Wonderland. It has all the fun of a Disney park but is much more relaxed. Even if you’re not interested in rides, a stroll through the park is a must. 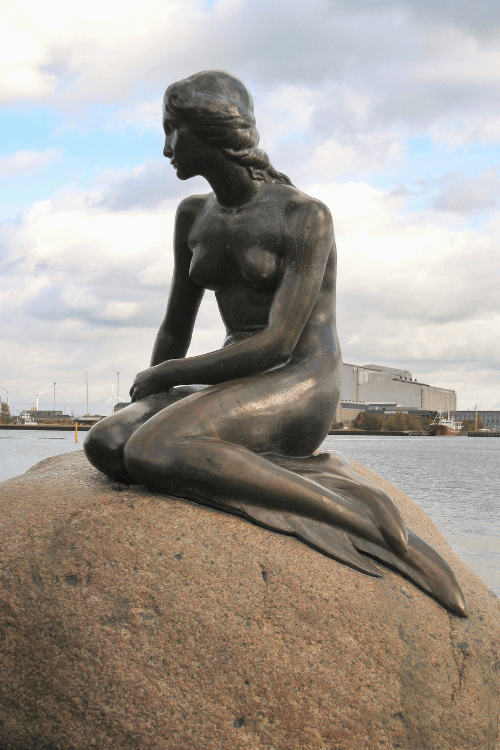 This 100-year-old statue honors Hans Christian Andersen’s The Little Mermaid from the story of the same name. She is one of the most famous tourist attractions in Copenhagen, but we’re not really sure why. The area around the statue is often crowded, and its location is out of the way from many of the best things to see in Copenhagen. Our recommendation would be to look out for it when you take the canal cruise–it will be pointed out. But, unless you’re a huge fan, skip a special trip just to visit it. But a walk down Stroget is also a great way to see some of the history of Copenhagen. Walking from one end of Stroget to the other, you’ll see fountains, squares, and historic buildings like the city’s Italian-inspired City Hall. There’s also the popular statue of author Hans Christian Andersen and other monuments to the city’s past. Detours off the main drag show you some of Copenhagen’s cutest shops and cafes. At least half the residents of Copenhagen use bicycles to get around every day, so it’s no wonder that renting a bicycle is a popular activity here. Like Amsterdam, the city is very bike-friendly, and it’s flat, which helps. Getting around by bicycle is easy—some even have a built-in GPS—and will help you cover a lot of ground quickly. Plus, it’s a great way to feel like local for a little while. Although Copenhagen isn’t known for its warm weather, we found a beach that was the perfect spot to enjoy some beautifully sunny moments. OK, so it was a man-made beach. On a floating platform in a canal. But it was fantastic just the same. In fact, we loved the beach at the Kayak Bar so much that we went back two days in a row. The café at the bar serves lunch and dinner along with fabulous wine—the perfect accompaniments to sunning on the sand and watching the kayakers go by in the canal. We took one day of our Denmark adventure to head just outside of Copenhagen to the city of Roskilde. Just a half-hour train ride away, Roskilde has two sites that make for a great day trip. Constructed during the 12th and 13th centuries, Roskilde Cathedral is a UNESCO World Heritage Site. The Gothic and Romanesque cathedral has been the main burial site for Danish kings and queens for 600 years, so it has numerous burial chapels and ornate memorials to see. Just down the road from the cathedral at the waterfront is the Roskilde Viking Ship Museum. 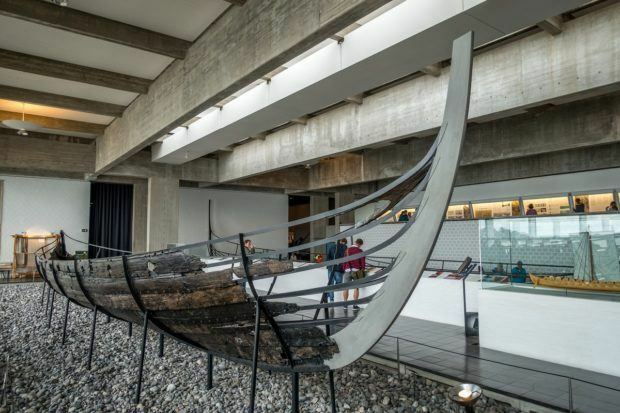 The museum houses the reconstructed remains of five Viking ships that date from the 11th century, which were recovered just a few miles away. Like giant jigsaw puzzles, the ships have been put back together, and the surrounding museum tells their story. Outside, visitors can watch ship builders, make their own rope, and participate in other hands-on activities. What do you think about How to Spend Three Days in Laid-Back Copenhagen? Very nice. One of my favorite cities! Thanks for sharing. Did you visit the Danske Tekniske Institute? We will be spending 3 1/2 days in Copenhagen in September, which seems like a good time to go in terms of weather and crowd size. Thanks for the great introduction to Danmark. I’m sure September will be great. No, we didn’t make it to Danske Tekniske Institute.